Knockout Vending business opportunity complaints: Have you had any dealings with the Knockout Vending opportunity? Please share a comment about your experience – good or bad – below, as well as advice for those considering investing in a Knockout Vending business opportunity. 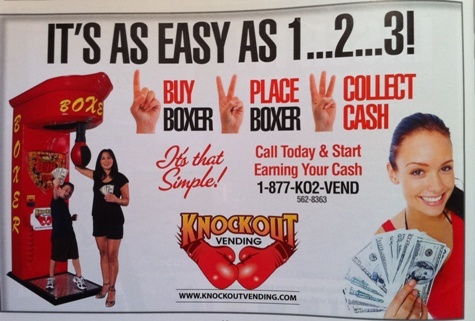 (Unhappy Franchisee) The Knockout Vending distributorship ads currently running in franchise and business opportunity magazines and websites claims earning cash with their vending opportunity is as easy as 1… 2… 3! Can it really be that easy? What do you think? “No matter how much or how little vending experience you have, we’ll assist in getting started and help you on your way to making fast cash. With their attractive lighting and MP3 sound, our punching machines… are often main attractions, earning effortlessly…. Is Knockout Vending too good to be true? In general, vending business opportunities generate huge numbers of complaints, including difficulty getting machines placed, machine malfunctions and maintenance issues, misleading earnings projections and outrageous promises by the vending companies. Is Knockout Vending an exception to the unsavory vending tradition? Hopefully, those with Knockout Vending experience will share their insights below. ARE YOU FAMILIAR WITH THE KNOCKOUT VENDING DISTRIBUTOR BUSINESS OPPORTUNITY? PLEASE SHARE A COMMENT BELOW. I purchased a single machine. Placing the machine has been very difficult. However, my biggest complaint is in the company claiming that the owner of the bar will cover the cost of insuring the machine. FALSE! The owner of the machine must cover all insurance costs, including liability. That will easily add $500-$1,000/yr to the costs of doing business. Had I known that, I probably would not have pursued this venture. You can certainly make money with these machines, but don’t invest $4k unless you have additional start up costs available to get this off the ground. Hi, I have Bought a Boxer Machine with Neil on January 2012. I Have somme problems about this Machine. * The Ball defleated each 2 hours after strokes, Please, Where and How can I buy another Inner Tube for the Ball. * The Ball turn after each stroke. *The Bill acceptor cannot work, There are any lights. They went out of business. Cool machine. Too expensive. You must split commission with owner of bar. The machines have non-stacker bill validators, dollars bills always getting stuck. No insurance cimpany wants to touch this company . It will cost you 100 month for liability only. My 50 vending machines soda and snack only cost me 20 dollars a month. THis was a good fad for a few years. If you have a machine, keep it in your gameroom, it is fun to punch after a few beers. I bought a machine….years ago….not from knockout vending….but another company. Luckily…..the company I bought it from bought it back because they knew some lady who wanted one. I got lucky. I got most of my money back. It was in a sports bar……..didn’t make much money. Glad I didn’t went with knockout vending. Doesn’t surprise me they went out of business. Its not a big money maker. Sales guy there sucked.